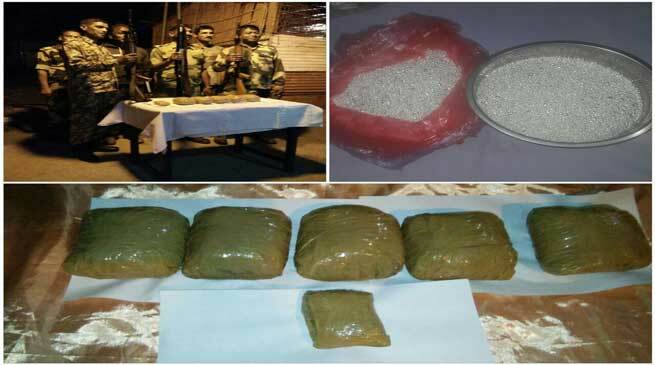 Troops of Border Security Force under Guwahati Frontier deployed in Coochbehar, seized silver weighing 20.940 kgs, yesterday, near the International Boundary in Cooch Behar district of West Bengal. On specific input provided by Border Security Force intelligence team of Cooch Behar Sector, West Bengal, at about 1745 hrs, troops of BOP Choudhuryhat seized 20.940 kgs Silver having an approximate value of Rs. 9,21,360/- from the border area. The consignment was being thrown over the border fencing when alert troops rushed to the area and seized the consignment, which was abandoned by the smugglers, who fled from the spot. The seized silver has been handed over to Customs Department for further disposal. Besides, BSF troops of Guwahati Frontier seized 64 cattle heads, having an appx value of Rs. 2,48,560/-, on the intervening night of 8/9 Nov 2016.